A quick word of thanks to all of you who’ve been so kind in the past two weeks toward my wife Ellen and I. Ellen’s father Ken passed away last week; while his passing was not unexpected, it’s never easy to lose a parent. Ken lived a long, eventful life and although I met him in his “twilight” years, I’ll always remember him as being an affable man who resisted the tempting urge to beat me up when he found out I had gotten his youngest daughter pregnant. I missed a BIG chunk of school because of the funeral arrangements – three days, plus one extra day of already scheduled professional development. It’s the second longest stretch of time I’ve ever been out of the classroom during the school year and certainly having it happen so close to the beginning of the first quarter will end up being something of a challenge as we go forward. Well, it finally happened – my boys have discovered Scooby Doo. I am AMAZED at the longevity Scooby Doo enjoys, especially in light of the fact that almost nobody my age remembers The Many Loves of Dobie Gillis, the show from which all the characters on Scooby Doo, Where Are You? are lifted. I myself was a huge fan of Shaggy, Velma, and company when I was a kid. I have vivid memories of my father egging me on into loud paroxysms of annoyance when he’d come home and tell me he thought Scooby Doo, in his words, “stinks.” How I would howl in protest… but time has once again proven my father to be correct. 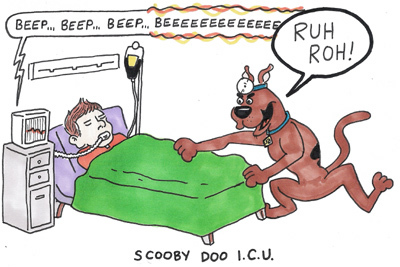 Scooby Doo does kind of stink. Of course, it has charm! The character designs remain top shelf and some of the voice work is spot-on. I’m just shocked at how… similar every episode of Scooby Doo is from one another. I remember them being quite distinct from one another in my mind’s eye, but watching two or three episodes just reaffirms the sameness that pervades most of the episodes. Also, has there ever been an episode of Scooby Doo in ANY of its’ dozens of incarnations where the writers actually play fair with the mystery element of the show? I know most children at home aren’t aspiring sleuths, but most of the solutions to the mysteries in the episodes we’ve watched make no good sense. 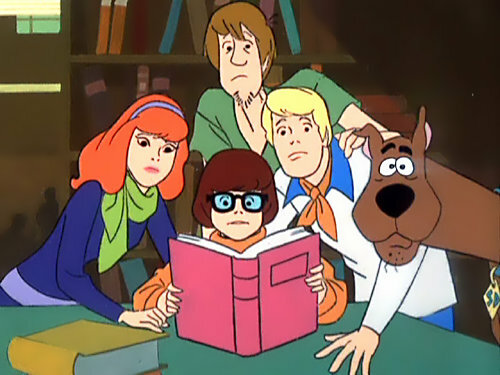 I’d love to watch a Scooby Doo series where the writers paid more careful attention to the mystery parts of the series. Maybe that version of the show exists somewhere! Let me know if it does; I’d eagerly watch that with Elliot and Henry on a weekday afternoon. After the Dune debacle of this past summer, I thought it might be time to retreat into some comfort reading for awhile. 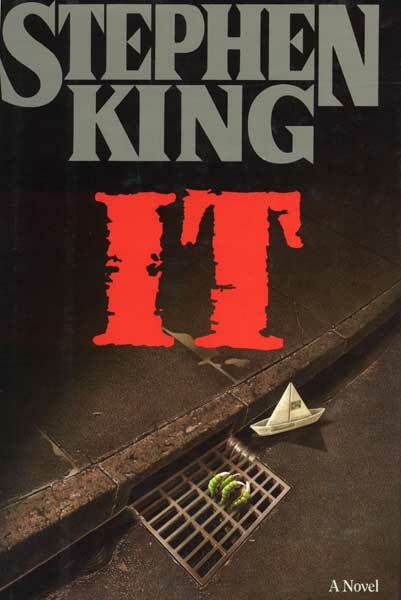 I chose It by Stephen King. I’m a fan of King’s work and I remember loving It when I read it in seventh grade. King’s always copped to being more of a writer of “the moment” than he would like and for sure, a lot of his books provide a window into what was going on in America during whatever time his novel was written. Sometimes this serves his books well- ‘Salem’s Lot holds up remarkably well as years go on in its’ portrayal of a small town disintegrating in the face of forces it can barely comprehend. That idea works great in the 1970’s, ’80’s, ’90’s, and today. It, however… It doesn’t seem to have aged well so far. The book seems to have “everything and the kitchen sink” thrown in and while that can be interesting to read, It never seems to focus very hard on anything in particular. That’s a flaw. I’m interested as to what it’s going to be like to read the ending of It again as an adult. I don’t want to spoil what happens in the book, but suffice to say… King writes a REALLY strange ending for his youthful protagonists in 1957. He devises a means by which the group of seven pre-teens can keep their bond intact after facing the titular monster of the novel… and it’s downright strange. As a seventh grader, that weird ending sort of washed over me; today I’m curious to see what my reaction will be. Elliot started back at preschool this week. It’s his final year before kindergarten and as such, he gets to bring his own lunch. Ellen went out and bought him a fancy lunch box… or at least, it looks fancy to me. I vastly preferred the plastic Thermos lunch boxes, with licensed characters on the front. 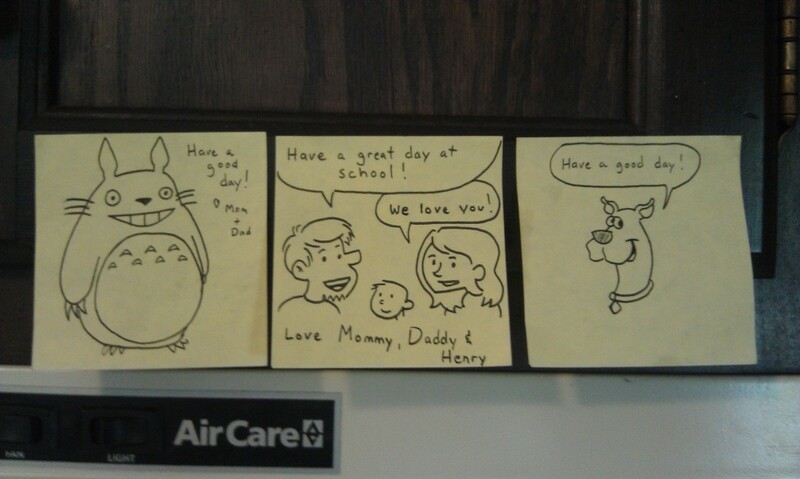 Anyway, Ellen asked me to draw Elliot something on his first day on a Post-It… and I’ve kept it up ever since. Ellen keeps sticking them up above the oven. Elliot and Henry have recently discovered Scooby Doo in a big way and they’ve been obsessed with My Neighbor Totoro since the summer. I don’t know if I’m going to keep drawing these or if this was just kind of a “first week” thing… but here’s the first three. …but it was a good thing I took the week off, because damn. Stressful week. Next week my 10th grade students are taking the Ohio Graduation Test, which is stressful for them but sort of an easy five days for me. I spend the morning proctoring and the school runs on a two-hour delay schedule for the rest of the week. Meaning I see most of my classes for about 20 minutes before the bell rings and sends them off to their next 20 minute class. All that’s just the long way around saying I’m back to posting comics and stuff… and thanks for being patient with me. 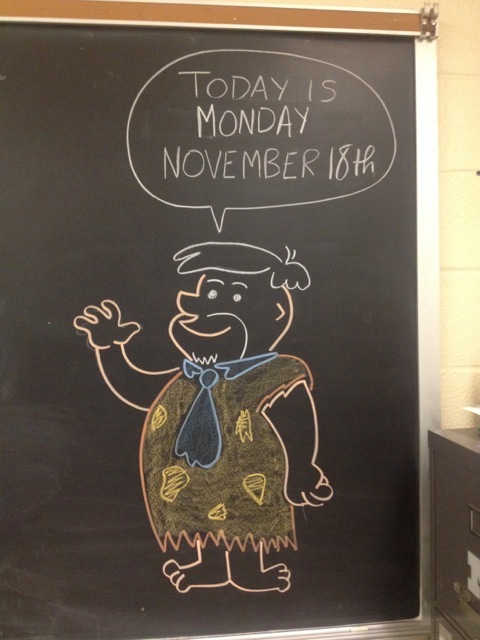 This week’s chalkboard drawings (last week’s, now that I think about it) are behind the cut.